Rogers' principal printer for all its consumer and trade publications is no longer simply a supplier, but is sitting at the boardroom table. According to Rogers spokeswoman Jan Innes, the company is well aware of the situation and will act accordingly if a conflict of interest arises. Funding for the Ontario Arts Council this year is to be increased by $5 million, bringing it to $55 million for 2008/09. The announcement was made by Ontario Culture Minister Aileen Carroll at a reception for Kingston area artists. The 2007 Ontario budget had previously included an additional $5 million increase in 2009/10, which means the OAC budget in that year will now be $60 million. It is not yet known what portion of that extra $5 million will be finding its way into support for the 30+ cultural magazines that now receive OAC funding under the grants to periodicals program. In her comments the minister noted that funding to the OAC has increased 140% from the Council’s 2003-04 budget of $25 million. This is true, but does not bring OAC funding back to the levels before the Mike Harris-era cutbacks. Carroll called on “all levels of government to foster the development and promotion of arts and culture”, something about which it is hard to disagree. Charles Oberdorf, a friend and colleague for many years, has been named the recipient of this year's Foundation Award for Outstanding Achievement at the National Magazine Awards. I was pleased to be one of the supporters of his nomination. The award is well-deserved not only for his teaching and mentorship (he is coordinator of the Magazine Publishing program at the Chang School for Continuing Education at Ryerson University) but also for a long and distinguished career as a stylish magazine writer and editor. You run out of fingers tallying up the magazines he has written for or where he's been an editor. This year's nominees for the Magawards, chosen from among more than 2,100 individual entries nationwide, were announced at a special reception at Restaurant Wilson in Montreal on Tuesday evening. The complete list of nominees can be found here. Once again, The Walrus had the most nominations (37), followed by Toronto Life (29), Maclean's (18), Report on Business (16), L’actualité (15), Explore (14), Québec science (9) and Canadian Business (8). The three finalists for the coveted Magazine of the Year award are L’actualité, Maisonneuve and Toronto Life. The winner of this year’s award for Best New Magazine Writer is Patrick White, for an article entitled “Red Rush” that appeared in The Walrus (April 2007). The same article is also nominated for an award in the category Science, Technology & the Environment. The NMAF’s third annual award for Best Student Writer goes to Julia Belluz for her article “I” that appeared in the Ryerson Review of Journalism. Julia's article is also nominated in the Profiles category. Honourable Mention goes to Dan Yates and Meena Nallainathan. Individually, writers John Lorinc, Ray Ford, Duncan Hood and Tabatha Southey received 3 nominations each. Photographers Benoit Aquin, Mario Miotti and Liam Sharp, and Illustrators Sam Weber, Graham Roumieu and Christian Northeast, each received at least 2 nominations. Prefix Photo magazine and its associated gallery is marking the passing of traditional photography with a feature called The Last Photograph by Brazilian artist Rosângela Rennó. Inspired by the corporate decision to stop the manufacture of photographic paper, she mourns the death of traditional photography in her most recent project. It's an exhibition curated by Elizabeth Matheson, in its North American premiere accompanied by an essay "Beautiful Death: On Rosângela Rennó’s Última Foto," by Cuauhtémoc Medina in Prefix Photo 17. The Last Photograph consists of a series of photographs of Rio de Janeiro’s iconic Christ the Redeemer statue on Corcovado hill alongside the cameras that were used to take them. Rennó’s project brought together practitioners of diverse photographic orientations in order to comment on the mechanical processes involved in traditional photography, processes eliminated in the shift to digital photography. Rennó’s choice of photographic subject challenges the edict of the archdiocese of Rio, which claims copyright over the public statue. Giving to each photographer a camera from her collection, Rennó commissioned all forty-two photographers to shoot the statue and the surrounding neighbourhood. The results include black-and-white as well as colour images, and range from landscapes to portraits. Rennó then permanently fogged the lenses of the cameras and mounted each of them beside the photograph it had produced. These diptychs constitute an elegant lament for the extinct processes of traditional photography. An opening reception for The Last Photograph will be held on Thursday, May 1, 2008 from 7 to 10 pm at Prefix Institute of Contemporary Art, located at 401 Richmond Street West, Suite 124. The reception will be preceded with an artist/curator walk through at 6:30 PM. The exhibition is part of Contact 2008 and continues until June 7. A magazine refers to branded, edited content generally supported by advertising and delivered in print or other forms. There is an apparently bottomless appetite (sorry) for recipes online, as evidenced by Transcon's decision to launch an English Canada equivalent of its French-language recipes website, drawn from various Transcon titles. According to a story in Media in Canada, RecipeFeast.com, will be a complement to, not a copy of Recettes.qc.ca, which attracts more than a million web surfers every month. Jocelyne Morissette, consumer websites director, Transcontinental Media says: "Our goal is to create a totally independent site that all English-speaking Canadians can enjoy." The website boasts over 1,500 recipes, half of which originate from canadianliving.com. The rest are translated from Recettes.qc.ca, and the goal is to have that percentage grow to include 90% user-generated content. Recipefeast.com treats users to an easy-to-navigate design that offers a recipe search, a recipe of the day, a top 10 list, cooking tips and a local food guide. Of course the principal reason for the site(s), aside from telling the readers what how to feed their families, is a variety of advertising opportunities including buttons, banners, section sponsorships and product placement. Giorgina Bigioni, who has for 20 years led the fashion and lifestyle division for St. Joseph Media and, before that, for Key Publishing Company, has been let go and her position as vice-president of the lifestyle group eliminated. It is part of a major shakeup in the management at SJM that was announced in a press release. It sees the division taken over by Lilia Lozinski who has been named senior vice-president of the style and lifestyle group, taking responsibility for Fashion, Wish, Weddingbells, Mariage Quebéc, Canadian Family and Gardening Life as well as custom publishing and the Montreal group led by Bettina Magliocco, who will also report directly to Lozinski. Bigioni apparently plans to start the Director Education Program at the Rotman School of Management later this month and spend the summer on the golf course with her family. In addition, Jim Warrillow will be joining as the chair of Where Canada where he'll work with vice-president and group publisher Sharon McAuley and the publishers of each of the Where magazines across the country. 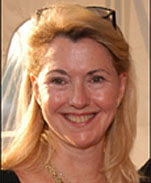 Effectively, it means that Warrilow, a former chair of the Rogers group of magazines, will be taking some of the administrative load off McAuley's shoulders (particularly the care and feeding of the various Where publishers across the franchise)in order to let her concentrate on building the Toronto Life brand. Andrew Crane become vice-president operations, with responsibility for digital operations, including production, I.T. and on an interim basis, the entire Web platform (this, following the dismissal of Ken MacLean, the vice-president of interactive media. Michelle Kalman is promoted to vice-president creative marketing. Though it is still hard to understand the "gold standard" rhetoric being employed to describe the Audit Bureau of Circulation (ABC) in its competitive battle with BPA over auditing services, ABC has some powerful people on its side; in this case, Rogers Publishing, the largest trade magazine publisher in the country and its second-largest consumer mag publisher. Rogers announced that 26 more of its publications will be measured by ABC, which already audits the Toronto-HQ'd publisher's other 26 titles. In the Rogers stable are some of Canada's best-known magazines, including Maclean's, Chatelaine, Flare, L'actualité and Canadian Business, as well as a number of leading industry, medical and financial publications. The 26 Rogers magazines that are being transferred to ABC are Baby & Toddler, Cosmetics, Mère Nouvelle, Mon Enfant, Newborn, Pregnancy & Birth, Ontario Out of Doors, Canadian Printer, CARD, Canadian Contractor, Canadian Grocer, Canadian Insurance, Canadian Machinery & Metalworking, Canadian Packaging, Coatings, Design Engineering, Food in Canada, Hardware Merchandising, HPAC, Le Journal Industriel du Québec, Materials Management & Distribution, Meetings and Incentive Travel, Onsite Heavy Construction News, Plant, Plastics In Canada and Purchasing B2B. Rogers Publishing president/CEO Brian Segal is, it should be noted, a member of the ABC board. "This consolidation will benefit our advertisers by providing the utmost in consistency and accountability, as well as centralizing in ABC's robust database the key information they need to plan their media buys," he said. Forget the scenery, says MoneySense, what did your house cost? MoneySense magazine, in a bid to take the arbitrariness out of the ranking business, just sticks to the facts and, using them, has come up with a list of the best places to live in Canada. Now, nobody who comes low in such a rankings likes them much, but city life is so complex that it is difficult to see how avoiding subjectivity altogether results in a well-rounded result. Still, we give points to MoneySense for the spin of having the "fairest, most unbiased guide you can find to Canadian communities." As a promotional gimmick, this is calculated to get a lot of attention paid as media in the high-ranking cities trumpet the results and in the low-ranking scratch their heads. The magazine calculates from a measurable but,it must be said, somewhat arbitrary basket of 16 hard numbers such as crime rates, housing prices, number of new cars, air quality, number of doctors, precipitation, number of days below 0 degrees and above 30 degrees and assigns points to each factor then ranks the result. If you've got the mountains in the backyard and the ocean in front, well, scenery doesn't count. By the magazine's criteria, this year, number one out of 154 measured cities is Ottawa-Carleton , followed by Victoria and Fredericton. Vancouver comes 10th. Ottawa comes first not by being excellent in any one category but cumulatively being OK in most of them. Some cities are simply baffled about the results: Nanaimo, B.C. comes 84th. The mayor says drily: "We all know that Nanaimo is one of the greatest places on Earth to live, and we appreciate them keeping it a secret for us." Izida Zorde, Editor, Fuse magazine. Canadian publishers will doubtless be looking hard at Hearst Publishing's decision to make an exclusive advertising deal with Wal-Mart to publish a new magazine supplement that will be carried in six of Hearst's consumer titles. The supplement is called 30 Days of Home and the retailer will use it to promote its new line of home furnishings called Canopy. According to a story in Brandweek, in addition to appearing in the June issues of Country Living, Good Housekeeping; House Beautiful, O at Home, O: The Oprah Magazine and Redbook, the supplement will be distributed free at Wal-Mart stores and will be featured on a dedicated website called 30DaysofHome.com. This will include audio, video, with clips of Hearst editors dispensing decorating tips. "In today's economic climate, big, glitzy, red-carpet events are fine, but the advertiser is really looking for ways they can have a connective experience with the consumer," said Michael Clinton, CMO at Hearst, New York. "Ultimately the consumer is led to action, going to their site to shop, going to a store and, in a perfect world, shopping for product." The program represents Hearst's first-time use of Web technology DigiMag. The software lets users explore Wal-Mart products at 30DaysofHome.com by scrolling over them and then lets consumers click to buy. "Knowing that home furnishings are high-consideration products, the site enables users to touch them with their mouse," said Chris Actis, vp/group media director at MediaVest, Wal-Mart's media agency. "It does a lot in trying to convey the quality." "We wanted to change the perception of product; to surprise the consumer that they can buy quality for less," said Robin Steinberg, svp/director of print investment and activation at MediaVest. In an announcement that may have implications for the magazine industry in this country, the federal government has launched a limited review of Canada Post. The Minister responsible for Canada Post, Lawrence Cannon, announced the appointment of a three-member independent advisory panel, headed by Dr. Robert Campbell, President of Mount Allison University. The other panelists are Mrs. Nicole Beaudoin and Daniel H. Bader. It is to complete its review by December 2008. Interested parties are asked to submit their comments by September 2, 2008. The review is limited to consultations with key stakeholder groups (like magazine associations) and receiving individual briefs. There are no plans for cross-country hearings. • Canada Post will continue to operate in a commercial environment and is expected to attain a realistic rate of return on equity. Magazines Canada and other interested observers have expressed concern that CPC has wandered too far from its policy responsibilities in recent years. This is particularly true for magazines. Large postal rate increases in recent years and its abandonment of the Publications Assistance Program (PAP) have demonstrated a disregard for its continuing public policy responsibilities, the organization said. It offered not the facade of intelligence -- a fake fireplace, decorative library ladders, a comfy "leather" chair -- but rather its own raw eccentricities. Magpie was perhaps the only bookstore in the entire country that didn't play the same euro-centric classical music all day long. There, one could negotiate the sounds of Gracie Fields one minute and Public Enemy the next, Zhou Xuan and Madonna, Yma Sumac and Nine Inch Nails, Emmett Miller and Rodney Graham, among others. Almost instantly Magpie became a community resource, the nexus of something new. In 2000 the owner of the store, Kevin Potvin, published a manifesto for the area in the Vancouver Courier entitled the "People's Republic of East Vancouver." The article drew so much attention that I designed a logo for it, the merchandise of which -- stickers, magnets, T-shirts -- remained popular sale items to this day. Several local festivals and even realty brochures now refer to the area as such, and Potvin soon established the at times infamous Republic of East Vancouver newspaper, copies of which are subscribed to from all over the world. I am sad to be closing Magpie, but I’m very happy to have operated so long on this wonderful street bringing to residents of my community such a wide array of interesting magazines and good books. It was always a delight, and it remains one now. Potvin says that changing public habits (staring off into space on the bus with ipods in their ears, rather than reading books, using laptops in coffee shops, staying home and surfing the web) were one of the blows. Another was the consolidation of the distribution industry. Where once the store had magazine supply contracts with up to 42 wholesale distributors, today only three remain after a serious round of mergers, takeovers, consolidations and collapses. The effect of industry consolidation was to reduce competition. The way so many wholesalers competed with each other was to offer good terms and lengthy lists of titles including many low-circulation, specialized magazines. After consolidation, the remaining wholesalers learned to respect each other’s turf, reducing competition more. They tightened up terms with retailers considerably. And they reduced their lists of titles by expelling the kind of low-circulation specialty magazines Magpie thrived on. Just as supply of these types of magazines became harder, demand dropped as well, as particularly those readers who sought out specialized content were among the first to discover the internet as a source.... But there are things the periodical industry could have done had they perceived the changes in time and had they imagined solutions that were available. For example, it is well-known in the magazine and newspaper businesses that the proceeds from sales of single copies at stores have never more than covered the accounting, collections, distribution and wasted copies costs of supplying stores. The only benefit to publishers of single copy sales in stores has always been the chance to attract new subscribers. The real business of periodicals is in advertising, a business that requires eyeballs at almost any cost. Publishers could have perceived the same changes already sweeping the digital music business and switched their way of doing business by offering stores directly-shipped free copies of their products, sill with a cover price, with the stores responsible for paying for shipping only. The result for publishers would have been the same neutral cost they already accept by employing the lecherous distribution industry, but they would have helped create many more flourishing stores happy to make space to push sales of what would then be very high profit margin products. I wrote an article seven years ago for the leading magazine-industry magazine explaining this solution. The article was rejected. That magazine itself went out of business the following year due to the same pressures. Magpie itself had developed intractable business problems. Around 2000, after operating for six years and arriving, as expected, at a time to re-capitalize, the unexpected arrival on the scene of Chapters Bookstores, with its predatory schemes—successfully executed—to wipe out most independent bookstores, made it suddenly impossible for any remaining bookstores to negotiate ordinary business re-capitalization loans at banks. The only financing available was through credit cards. Rather than close after six years, I made the choice to take credit card money, the crack of financial markets. Since then, the amount the store has paid in interest rates on credit cards is equal to almost two times the capital borrowed against them. Credit card interest rates, though at a period of historically very low Bank of Canada overnight borrowing rates, were such that Magpie had in seven years paid the borrowed capital back twice over and yet still owed the total amount again. Pleas for lower more reasonable rates fell on coldly deaf ears. I know, I know, in a world of text messaging and spell checkers it seems retro and so last week to worry about typography and punctuation. But while magazines still set type and read left to right, top to bottom and front to back, these things matter. Which is why I enjoyed this article about Ten typographic mistakes everyone makes, from the British blog Receding Hairline. It details the mistakes and things you can do to fix them or stop making them. My favourite is to remind us that parentheses ( ) are not brackets [ ]. NOTE: The Sheridan Headlines show of graduate student work in the Illustration program is Thursday 24th 7 pm - 1 am and Friday 25th, 3 - 10. See earlier posts here and here for details. The Ontario Arts Council has revised its guidelines for its Grants to Periodicals Program. There are a number of significant changes, including removing the ceiling on grant amounts, allowing controlled circulation and online magazines to apply, instituting an easier-to-use application process and providing for three-year funding. 1. The circulation ceiling funding categories have been eliminated to allow magazines to apply for what they need to publish, promote and distribute. The grant levels will be based on a percentage of their revenues as appropriate to the sector, the program budget, their assessments and the OAC’s current strategies. Grant increases will be phased in over a few years. 2. Grants are generally intended for magazines with circulations below 30,000 but exceptions will be made for culturally significant publications that fit all of the other eligibility criteria. 3. Free-circulation magazines will be eligible to apply to the program if they fit all of the other eligibility criteria and if at least 60% of their pages are editorial content and at least 25 per cent of their revenues come from advertising sales or a combination of advertising and circulation sales. 4. Online magazines are eligible to apply if they fit all of the other eligibility criteria, are published on a regular basis and can demonstrate at least 2,000 unique hits per month. 5. The assessment criteria are now Artistic Merit (50% weighting), Impact (25% weighting) and Viability/Governance (25% weighting. 6. The application forms have been modified to better suit the sector and to allow greater ease of application. 7. Three-year funding will become available in 2009/10. Derek Finkle's name should probably now be included with other muckraking journalists and writers who have championed unpopular causes and were vindicated by events. Baltovich had been released pending appeal in 2004 and Finkle's book played a significant part in that. The book questioned much of the case, including the thoroughness of the police investigation and the fairness of the 1992 trial. For his pains Finkle was subpoenaed to turn over the audiotapes and notes of his interviews, particularly the 50 hours he spent interviewing Baltovich in jail. Eventually, backed by PEN Canada and others, Finkle prevailed and the court rejected the request. Today, in Toronto, the Crown essentially acknowledged the truth of the book and Baltovich was acquitted and set free. Of course it wasn't just Finkle who championed Baltovich's cause -- he owes his freedom, too, to the tenacity of his defence team James Lockyer, Joanne McLean and Heather McArthur. While it seems unlikely ever to be proven, the inescapable conclusion now that Baltovich has been freed is that Bain was probably killed by serial killer Paul Bernardo but that the police's fixation on Baltovich as the prime, and only, suspect, caused them to avoid exploring other possibilities. Baltovich is now faced with rebuilding his life, something he might never have achieved without Finkle's determination. For background on this case, see the excellent summary by Kirk Makin online at the Globe and Mail. 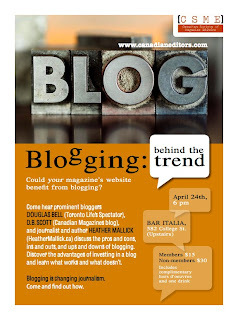 Thursday night 24th in Toronto is the Canadian Society of Magazine Editors mixer with a panel on blogging. I will be up there with Douglas Bell of Toronto Life's Spectator blog and Heather Mallick of CBC.ca and the Guardian's Comment is Free. It's upstairs at the Bar Italia starting at 6 p.m.
[UPDATE and CORRECTION] Thursday night24th, 7 - 1 and Friday night 25th 3 - 10 pm is the second annual graduate show of students from Sheridan College's Illustration program. The first show was spectacular and heartening for those of us who love the art of magazine illustration. The second, which takes place at the Burroughes Building at 639 Queen Street West in Toronto promises more inspiration. The deadline for responses to the Department of Canadian Heritage's plans for a major renovation of the Canada Magazine Fund and the Publications Assistance Program is end of business, Friday 25th. This is a very important watershed for the industry, particularly smaller, specialized cultural and literary titles. Just keeping up with all the developments in magazine design is exhausting, but if you feel as I do the need to know what's happening and what's coming, we are fortunate that Smashing Magazine has posted two excellent lists: one of some selected pdf magazines (I particularly like Grafika and Candy -- see above); another of 40 online design/tech magazines that are worth the trouble. Very nice. In an article published today on Mastheadonline about his company's wish to have its trade titles served by Magazines Canada, Rogers Media CEO was blunt about his views of the trade association Canadian Business Press (CBP). Rogers left CBP late last year and has been in negotiations with Magazines Canada to have its members accepted. The Masthead interviews (including clashing views from proponents and opponents) follows on a story first published here about the Magazines Canada board recommending to the association's June AGM that the restriction of trade publisher memberships be dropped. Yet another newspaper-carried glossy men's magazine has dropped out of the Globe and Mail today. 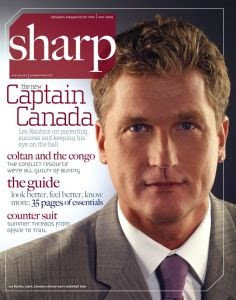 As reported here earlier, Sharp is the brainchild of former partners in Driven -- with which they will be going head-to-head -- and seems remarkably similar in content and design: fast cars draped with gorgeous women; chunky and expensive watches and other toys; yet another spread on men's suits (has there ever been man who went out and bought a suit based on a magazine fashion spread?). The controlled circulation is 150,000 copies and the magazine plans to publish 5 issues in 2008 and 6 in 2009. The partners in Contempo Media are publisher John McGouran, editorial director Michael La Fave and creative director Laurence Yap. Craig Silverman, author of Regret the Error, proprietor of self-same-named website and freelance Globe and Mail columnist, has posted some thoughts on his own website suggesting how freelancers and editors might divert themselves from lamenting their circumstances and doing something about fixing them. Being a freelance writer today is remarkably different than it was when I sold my first article 12 years ago. To name a couple of the more discussed points, pay rates haven’t changed much over the last 30 years (at least in Canada), and new contracts being offered by publishers demand more rights than ever before, which can make it tough to resell and republish work. I’m not interested in complaining about the situation because I’m equally tired of hearing editors and others complain about their plight: falling revenue and subscriber numbers, fragmentation of the audience etc. These are serious challenges, but it’s time to focus on solutions. And then he suggests some specific ideas and invites more. Interesting. It's not just in Toronto or Canada that there's occasional consternation about unpaid internships. In Britain, the National Union of Journalists has released a survey of 644 journalism graduates who qualified in the past five years. And it claims that exploitation is rife among magazines, newspapers, broadcasters and websites. According to a story in UK Press Gazette, the union said employers could be breaching minimum wage legislation by keeping people on in unpaid roles. Newsrooms are offering potentially illegal work experience placements to journalism graduates lasting months, giving them hollow promises of paid work and relying too heavily on free labour, the NUJ has warned. Unless things improve, the union said, it was going to name companies that were the worst offenders. Just over half of all respondents took work-experience placements after graduating from their journalism courses. More than 15 per cent did between three and six months continuously and 6.8 per cent were on placements lasting more than six months. More than half of respondents (56.3%) said they received only limited help and guidance and of the 90 per cent who had their work published, only 20 per cent said they were "always" or "sometimes" paid for it. Some newly qualified journalists found their placements useful: 43.7 per cent said they were given clear support and guidance, but 56.3 per cent said they received limited help. While 42.7 per cent were told a placement could lead to a permanent paid job, only 24.1 per cent of those were taken on. Dear said he accepted that work experience was a “vital element of a student journalist’s training”, but that some employers were creating “bogus placements”. One person who did a three-month internship three years ago with a women’s monthly said there were two features interns and two to three fashion interns all working at once. This week's Time magazine cover (US), for only the second time in its history, has replaced its trademarked red border with another colour, in this case green. It's to highlight the cover story on global warming and climate change, illustrated by a takeoff on that perennial cliche, the flag raising at Iwo Jima. 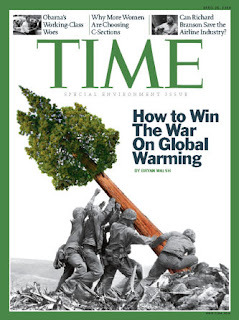 How to win the war on global warming, its main coverline trumpets. "This is our latest environment special issue but also a historic first: for this one issue, we've exchanged our trademarked Red Border for a green one. By doing so, we are sending a clear -- and colorful -- message to our readers about the importance of this subject, not just to Americans but to everyone around the world as well." The cover story -- "Green Is the New Red, White and Blue" -- written by Time's Bryan Walsh, "is our call to arms to make this issue -- perhaps the most important one facing the planet -- a true national priority." Quote, unquote: How far can you go in defending a magazine's integrity? Advertisers want to borrow—or steal—the credibility and authority we have with our readers. And we want to give it to them without threatening the credibility and authority. [At National Geographic] we’re always asking ‘How far can we go with this?’ It’s a constant internal struggle. Small magazines are not small because we want to be big but just don’t know how. We are a completely different animal, and I am not sure if we ought even to be forced to compete for funding with the big, consumer titles. The New Quarterly, and arts and literary magazines like ours, resist profitability and marketshare as measures of our overall worth, as we believe that what we do—provide a venue for the development of Canadian artistic talent which later goes on to national and international acclaim—has a high intrinsic value that will likely never be matched by the size of our audience or revenue. Profitability is an excellent measure for commercial magazines, because that’s how they measure themselves, and so of course that’s likely how they want all magazines to be measured. Which is not to say they do not also aspire to high editorial quality and providing a real service to their audience – of course they do. I’m merely suggesting that profitability is a more important measure for big commercial titles, whereas editorial excellence/support of new Canadian talent is a more important measure for smaller, not-for-profit niche titles, so we should each get our own formula, our own application process, and our own pool of funding. The way it’s currently done is like putting a bunch of sharks and a bunch of frogs in the same pool and then having a swimming contest. Sure, it’s not completely unfair -- the frogs can swim, they need to, they like to – but it’s not what they’re designed to do. But if the contest is just open to frogs, doesn’t vertical leap make more sense? Not to mention, having us all in the pool basically makes us…shark food? (Do sharks eat frogs? A sad hole in my science education! Anyway). We hope that DCH is listening. Transcon clarifies issue of term "promotional use"
A follow-up on an earlier post about the apparently sweeping interpretation that Transcontinental Media had put on its rights to provide promotional access to articles. As readers may recall, writer Kim Pittaway had been told that Transcon had given permission for the full text of an article she had written for More magazine to be reprinted, without payment or consultation, in a publication of the Rotman School (the subject of the article). "Our policy is that we may authorize a third party site to make reference to, or limited partial reproduction of, one of our stories provided they put a link which brings the reader back to our site for the full text; it’s deemed promotional use. In cases where a third party wishes to reproduce the full text of a freelancer on their site, it is Transcontinental’s policy to refer the requestor to the copyright holders (writer and photographer/illustrator) for approval. I’m sorry for the error and I hope that this clarifies the situation." It's hard to see what substantive difference there will be for advertisers and agencies with the decision of the Star Media Group, Transcontinental Media and Sun Media pulling their daily newspapers out of the Audit Bureau of Circulations (ABC). Their 30 titles' circulation will, after all, be measured now by the Canadian Circulation Audit Board (CCAB), a division of BPA Worldwide, a company that already provides pink sheets for a very large number of magazine titles and community newspapers. There seems to be very little to choose between the two, competing services in terms of data delivered. Yet people like Hugh Dow of M2 Universal, express shock (!) at the decision which has been rumbling around in the background for months. "I can't begin to express how shocked and disappointed I am at this shortsighted move," he said. "In an environment in which newspapers are struggling to retain readers and advertising revenue, this will only make media buyers more apprehensive and wary. "ABC has been the gold standard of auditing since its founding nearly a century ago, and those standards are needed more today than ever," Dow continued. "We are now supposed to accept two different standards in Canada? I cannot imagine a worse time to make the newspaper buying decision problematic." Dow doesn't say how using data from a different company to certify the printing and distribution of copies makes the buying decision difficult. Nor, with all the handwringing, are there any specifics about what makes the CCAB auditing process, which already serves most magazines and community newspapers well, somehow is less reliable or less rigorous. Yet a release prepared by ABC quoting a number of agency worthies suggests that it knew this was coming and had a prepared counterattack. The Canadian companies (with the exception of CanWest) have apparently been looking for a "made in Canada" option for some time. In February, CCAB created a newspaper advisory group with reps from the newspapers and agencies as part of a concerted attempt to win the business.The newspaper companies gave as one of their reasons for the move that they wanted to consolidate the data-gathering for their dailies and community papers. The future of magazines is not new media, it is magazines, says consultant Rebecca McPheters in an article published by Media Industry Newsletter (MIN). The problem is that agencies and otherwise rational commentators remain oblivious to the facts and are being allowed to marginalize the industry. It is important not to lose sight of the fact that the true value of any medium lies in its ability to deliver desirable and engaged audiences to advertisers' messages. Publishers must not neglect their core medium--which has tremendous and growing consumer resonance. McPheters, the former New York Times Magazine Group executive and Simmons president, now heads the consultancy McPheters & Co. She wonders why has the industry been unable to effectively communicate its strength to advertising and agency executives and says magazines' ability to become stronger in reaching and engaging consumers hasn't protected them from the damage done by advertisers' current fascination with new media and their apparent blindness to the tenets of effective advertising. As electronic media have become increasingly fragmented, ever-larger amounts of time and money are being spent in pursuit of ever-smaller audience segments. Advertisers, agencies, and even publishers have become active participants in this trend. As if that were not enough, new media is often held to exceedingly low standards in terms of its ability to deliver advertising that consumers will actually see, and with which they will become sufficiently engaged to possibly respond. Yet advertising requires meaningful exposure to offer even the opportunity of effectiveness and--for marketers who are dependent upon large bases of potential customers-- reach of those customers should still be paramount. The spunky literary quarterly The New Quarterly of Waterloo, Ontario ventures out of province to launch its latest issue. It will be at the Blue Metropolis International Literary Festival on May 1 to promote its themed Montreal issue which contains many writers from in and around that city. Blue Metropolis , celebrating its 10th year, is bringing together over 230 writers and 14,000 participants for readings, workshops, interviews and panel discussions. The issue aims to introduce The New Quarterly’s readership to current Montréal creative writers. As well as strengthening and establishing linguistic and geographical boundaries among The New Quarterly’s writers and readership, the Montréal issue is straddling the boundaries of genre: photographer Terence Byrnes writes the literary subjects of his portraits into closer conversation, and poet Robyn Sarah investigates and interweaves the contiguous lives of Hungarian-Canadian sculptor and functional-object artist Tibor Timar and photographer D.R. Cowles, who now share studio space in Montréal’s Mile End." UPDATE: a complete list of contributors in the issue can be found on the magazine's website. Transcontinental Media's TheHockeyNews.com , which enjoys more than 380,000 unique visitors every month, has announced that it has launched a free mobile platform; according to a story in Media in Canada, selected THN content will now be available on portable devices such as cellphones and Blackberries by typing in mobile.THN.com. Caroline Andrews, publisher, sports & entertainment for Transcontinental said: "There is a huge appetite for the hockey news and features that THN.com is famous for delivering, so having a presence on mobile plays perfectly into the behaviour of THN.com's core audience." The ASME considerations apparently follow on a similar discussion in Britain where it seems there may be a voluntary code forthcoming that will guide editors on use of electronic buffing, slimming and virtual surgery. Folio: reminds us that Glamour, which came under fire for its apparent slimming of Ugly Betty star America Ferrera (Glamour denied they did so); Time placed a teardrop on Ronald Regan for its March 2007 cover; and Blender put Britney Spears’ head on someone else’s body. Honouring excellence in circulation is the goal of the ACE awards (Awards for Circulation Excellence), given out each year at MagNet: Canada's Magazine Conference. Nominations for the awards, including the prestigious Marketer of the Year and the CMC Caren King Scholarship, are due by May 12, 2008. Details at the Circulation Management Association of Canada (CMC) website. You can read the department's proposals at its website and some questions that can be directly answered, though respondents needn't feel their comments are restricted to those. While publishers who are eligible for PAP and CMF now have an obvious interest, every publisher should probably be interested in influencing the ultimate outcomes of the review, which may be quite radical and sweeping. See earlier post on this here. It also may provide another place to sell space. Randy Craig, director of advertising and marketing at Cottage Life, says the market for My Lake was wide open. “There really isn’t anything available out there today that has the opportunity for cottagers to connect,” he says. Remax and Ford are already advertising on the space, Craig says. As individual lakes build up their forums, he anticipates independent local real estate agents will want to get involved. First, the pay wall; now advertising. Whatever next for The Atlantic? A couple of months ago, the venerable American magazine The Atlantic took down its pay wall. Now it is (gasp) about the embark on its first advertising campaign as well as revamping its print version and its burgeoning online site Atlantic.com. According to a story in Folio:, a European ad agency has been hired to manage the rebranding of the 15o-year-old title which will attempt to make The Atlantic more of a multi-platform experience. According to the most recent comScore numbers, TheAtlantic.com’s monthly uniques rose 188.6 percent to 661,000 last month from 229,000 in March 2007, a jump of 188.6 percent. Nathan Whitlock, the review editor of Quill and Quire magazine, will be presenting a comic mock lecture as part of This is Not a Reading Series. Called "Seven Steps to a Seven Day Novel", the lecture celebrates the release of Whitlocks' first novel A Week of This: A Novel in Seven Days (ECW Press). Songs inspired by the darkly comic tale about the lives of an extended family will be sung by Alex Lukashevsky. It's all at the Gladstone Hotel Ballroom, 1214 Queen Street West, Toronto at 7:30 p.m. (doors open at 7). This is Not a Reading Series is presented by Pages Books & Magazines, ECW Press and EYE weekly. 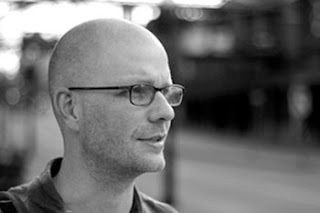 In addition to Quill, Whitlock has written for maisonneuve, Geist, Saturday Night and Toro. Cultural magazines within the Magazines Canada membership include art, literary, Aboriginal, issues and gender based titles, regional titles, culturally, socially and racially diverse titles, and environmental and health titles. Many of these magazines are not “small” in the historical sense of the CMPA (Canadian Magazine Publishers Association--our old public name); these cultural magazines of varying sizes have far more similarities than differences. Magazines Canada’s cultural magazine members are diverse; they are written in Canada’s two official languages (as well as other languages that form the ever-evolving Canadian mosaic), and are published in every province and territory in the country. After many months of discussion the Small Magazines Committee recommended to the Magazines Board that the name change be made to the Cultural Magazines Committee. The Board approved the recommendation on March 31, 2008. The board of Magazines Canada is recommending to its members that trade magazines be welcomed as members. The proposed bylaw change will be considered at the Magazines Canada annual general meeting in June and would remove the restriction on trades from its bylaws which have, until now, allowed membership only for consumer magazines. If approved, as seems reasonably likely, this bylaw change could result in a tectonic shift in the business, clearing the way for developing some sort of "trade" caucus within an expanded Magazines Canada. And it is not good news for Canadian Business Press (CBP) which, until now, has said that it speaks for the business-to-business sector. Frequent readers will know already that one of the biggest publishers of trade magazines, Rogers Publishing, has pulled its members and their membership fees out of CBP and started talks with Magazines Canada. CBP says that Rogers represented 20% of its members and 9% of its revenue. However, it doesn't take a weatherman to see which way the wind blows. Should other major trade publishing companies follow Rogers's lead, CBP might be unsustainable. While there have been suggestions in the past that the two associations merge, and that the industry speak with one voice, there has been significant resistance from the CBP side. In fact, that option is probably now off the table since CBP President Phil Boyd -- a paid employee of the association -- has said he believes that the two kinds of magazines are "fundamentally different" and he is firmly in favour of maintaining an independent trade publishing association. There are implications beyond the membership budget for CBP. For instance, the Kenneth R. Wilson (KRW) Awards for trades might have expected 175 entries from Rogers books in previous years; this year it got 10. CBP is also a senior partner (with Masthead magazine) in the annual conference Magazines University. (At one time, Magazines Canada and the Circulation Marketing Association of Canada (CMC) were also partners in Mags U, but pulled out ago and are now in the second year of running an event of their own, called MagNet in partnership with the Canadian Society of Magazine Editors (CSME). The two conferences run simultaneously this year. Magazines Canada has more than 300 member consumer magazines (not yet including Rogers' trade titles). One of the first postings on this blog three years ago was about the need for discussion about an umbrella organization for magazines in Canada. Most of what was said then remains necessary and plausible. According to a story in the Winnipeg Sun, the local of the Communications, Energy and Paperworkers Union of Canada have voted overwhelmingly in favour of strike action at the Transcontinental-LGM Graphics plant in Winnipeg. This is a plant which prints several mid-sized magazines, including The Walrus. CEP Local 900G, which represents about 300 workers in print and design media, said members voted 99% in favour of a strike mandate. President John Webster said the union is "not interested in negotiating backwards." Transcontinental had proposed various concessions in the collective agreement at the Transcontinental-LGM Graphics plant on Moray Street, including the elimination of the pension plan, reduction of vacation time and mandatory overtime. The employer has threatened to close the plant, jeopardizing 141 jobs. Formula Media Group (a division of Metroland Media Group/Torstar Corp.) has launched a new magazine called Suburban Life. The polybagged outsert will be distributed six times per year to sine 210,000 households in the Golden Horseshoe ranging from Niagara to Uxbridge and Thornhill to Barrie, according to a story in Media in Canada. "We are confident that advertisers will want to reach these homeowners with their advertising messages," says publisher Brad Rome. "We have cherry-picked households with an average income of about $118,000. These are people who like to be busy and have money to spend on their home, vehicles, leisure and entertainment." Editor Diane Tierney adds that the magazine targets active, energetic readers ages 35- 55 with children. "Our editorial topics include home and garden ideas, entertaining tips with recipes, local travel and entertainment, fashion, finance, fitness and more. These suburban readers will also appreciate that all our ideas are practical, achievable and affordable." Its first issue contains interviews with HGTV host Mike Holmes of Halton Hills, Global TV news anchor Anne-Marie Mediwake of Oakville and Toronto Argonaut Tony Miles of Burlington. References to the magazine's web edition (www.suburbanlife.ca) will be routinely scattered throughout its print pages. Quebecor World may have taken a step or two back from the brink of bankruptcy with the signing of a multi-year agreement with Wenner Media to print Rolling Stone, US Weekly and the Men's Journal, according to a story in the U.K. magazine PrintWeek. Last week the company signed a $285m (£143.8m) textbook printing agreement with McGraw-Hill. The deals are a sign of hope for Quebecor World which had up to now been plagued by clients jumping ship, most notably Rodgers' move to rival Transcontinental, which saw it leapfrog Quebecor as Canada's largest printer. In January, Quebecor filed for Chapter 11 in the US and bankruptcy protection in Canada and has since been restructuring its operations across the globe, including the closure of its plant at Corby, Northants, as it attempts to return to profitability. The former editor of Toro magazine and a current columnist for Maclean's are among four Canadian journalists who are finalists for the annual World Press Freedom prize. Author Derek Finkle, formerly the editor of Toro, Maclean's columnist Mark Steyn, Bill Schiller, Toronto Star Asia correspondent and freelance journalists and reporters Joel-Denis Bellavance and Gilles Toupin of Montreal's La Presse will be considered for the $2,000 prize. It is awarded each year to the Canadian media worker who, in the view of the jury, has made the most significant contribution to press freedom in this country over the previous 12 months. Past winners have included the Vancouver Sun's Kim Bolan, Haroon Siddiqui (Toronto Star), Andrew McIntosh (National Post), Tarek Fatah (Canadian Islamic Congress), andDr. John Hoey (Canadian Medical Association Journal). The prize will be awarded by the Canadian Committee for World Press Freedom at a lunch event marking World Press Freedom Day on Friday, May 2nd at the National Arts Centre in Ottawa. Magazines need websites. Tools like Dreamweaver make it really easy to make websites if you know print design. People with magazines tend to know print design, so they make their own sites. The problem is that web design and print design aren’t the same thing and most people don’t know that. When you really enjoy a website, it’s probably not because it looks good, but because it works. You understand what you need from it, and how to get that; same as a magazine (think about the disconnect when you pick up a magazine without a table of contents). Transferring print technique to the web, while hopefully resulting in beautiful typography and white space, usually is a colossal failure. I don’t read Masthead to discuss what my magazine would be if it was a song; that’s why I read personal blogs. I read Masthead for industry news. Two Roger Publishing trade magazines, Canadian Grocer and Pharmacy Post, are to run a special advertising section in May that promotes magazines. The intention is get the benefits of magazines as a product in front of the people who run the newsstands and racks in grocery and drug stores. Content will highlight the benefits of magazine merchandising, the ways magazines can create higher margins and increased traffic and various pieces of data about magazine sales, including benchmarks for dollar sales per store, general trends and a list of the top 50 magazines by sales. Canadian Grocer, one of Canada's oldest magazines (122 years) has a request circulation of 15,000. Pharmacy Post reaches 14,000 pharmacists/owners/managers, and 2,000 merchandisers, frontshop managers and buyers. Advertising close is April 17. Maclean's magazine has expressed itself relieved that a case filed against it at the Ontario Human Rights Commission will not be proceeding; but it objects strenuously to the language used in issuing the ruling. The complaints concerned an article in its October 2006 issue titled "The Future Belongs to Islam", which was an excerpt from columnist Mark Steyn's book "America Alone: The End of the World as We Know It. Complaints were submitted to Human Rights Commissions in B.C. and Ontario in November 2006 on the grounds that "the article subjects Canadian Muslims to hatred and contempt," according to a CIC press release at the time. In the release, the Canadian Islamic Congress labelled Steyn's article as "flagrantly Islamophobic." The Commission recognizes and understands the serious harm that such writings cause, both to the targeted communities and society as a whole. And, while we all recognize and promote the inherent value of freedom of expression, it should also be possible to challenge any institution that contributes to the dissemination of destructive, xenophobic opinions. It's on the second floor of Bar Italia, 582 College St. , Toronto, at 6 p.m. CSME members $15; non-members $30. The current (May) issue of Bon Appetit magazine has turned over its business side masthead as an advertising promotion, according to an article in Advertising Age. We wouldn't have thought there was much real estate left in magazines still untouched by advertisers, not after Mini USA appropriated the staples in Rolling Stone. But Starbucks has found some. The masthead is presented in the form of a coffee-shop chalkboard, with handwritten comments from various names on the business side saying what they like to have with their favourite Starbuck's blend at home. Among the choices: lemon and yogurt granola and pecan pie. The masthead, which is marked "promotion" at the top, is one page in a two-page Starbucks spread. The ad was the result of collaboration among the marketer, Conde Nast's Bon Appetit and the MediaVest media agency after MediaVest sent a "call for innovation" to its print partners. The reason the digital world is growing is simply that it's better for people, says Digitas chairman/CEO David Kenny said . Speaking at the conference of the Canadian Media Directors Council (quoted in Media in Canada), he said:"You already know the most important part of this in order to be great digital executives - whether that's media planners or buyers or clients - is understanding human beings. "They can get what they want, when they want it, how they want it," Kenny continued. "They can get ads that are relevant to them and ignore the ones that aren't. In the past, we'd just throw money at it and buy our way into their hearts and minds. Schizophrenia Digest magazine, published out of Fort Erie by Magpie Publishing, has launched a new website to encourage discussion of the disease. It's called LetsTalkAboutIt.ca and editor and publisher Bill McPhee says it is "a place to share your story and read about the stories of others who have suffered, or seen their loved ones suffer, from schizophrenia. The site also facilitates a dialogue with government officials to urge them to provide better support, treatment and medicine to schizophrenia sufferers." 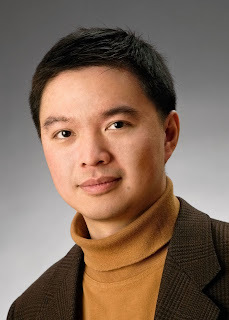 Wah Keung Chan, the founder, president and editor-in-chief of the Montreal-based magazine La Scena Musicale will be honoured on April 14 by Vanier College during its 10th annual Big Band Benefit for his role in promoting classical music and jazz throughout Canada. Wah Keung is a Vanier graduate and founded LSM as a free national music magazine, in 1996. The evening's festivities will be hosted by Montreal jazz piano legend Oliver Jones, while tributes will be given by internationally renowned countertenor Daniel Taylor, local Montreal philanthropist Noel Spinelli, and retired Vanier math professor Carole Channer, Wah Keung's first mentor. Also performing will be The Vanier Stage Band is made up of 19 young instrumentalists and singer Shaday Lavallé under the direction of Jocelyn Couture and the J.L. Big Band, conducted by Christopher Smith, an ensemble of some of the best jazz musicians in Montreal who get together every Monday night to perform new repertoire collected by their director Jean Lessard. Proceeds from the evening's concert allow Vanier College to give bursaries to outstanding music students at the school. A group of Canadian magazines, newspapers and outdoor media companies have donated ad space worth about $800,000 to the cause of literacy. This is the 8th year for the Gutenberg Media Grab. Donated ad space is sold at 65% off rate card value and all proceeds go to ABC CANADA Literacy Foundation. The money goes to support initiatives that raise public awareness of the issue of low literacy among Canadian adults, direct individuals to literacy organizations in their community, and provide resources that support and encourage the development of workplace literacy and essential skills training across Canada. "We are most grateful for the generosity of this country's major newspaper and magazine publishers, and major outdoor media," says Margaret Eaton, President, ABC CANADA. "Offering people the chance to buy major media at a fraction of its usual price is a great win for media buyers and for ABC CANADA." Anyone interested in ad space need only register for the sale by going to abcmediagrab.ca. The registration deadline is Friday, April 18, and the first-come, first-served sale starts promptly at 9:00 a.m. on Monday, April 21. All purchases must be new business and cannot be counted against existing or future space commitments. Ads must be placed by December 31. Among the magazines participating: Canadian Business, Canadian Gardening, Canadian Living Magazine, Chatelaine, Cottage Life, ELLE Canada, Explore, Glow, Harrowsmith Country Life, Homemakers, Maclean's, MoneySense, PROFIT, Report on Business Magazine, Style at Home, Tidings - Canada's Food & Wine Magazine, TIME, Today's Parent, Vancouver Magazine, Western Living and Zoomer Magazine. "I would go to the wall for the semi-colon." -- Barbara Zatyko, Magazines Canada General Manager & Publisher. 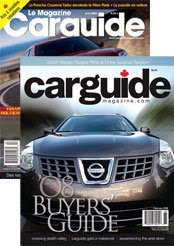 Formula Media Group, a specialty publishers of magazines such as Boating Business, Canadian Autoworld, Carguide, Le Magazine Carguide, West of the City and World of Wheels, has signed up to have its fulfillment done by CDS Global (formerly Indas). An interesting wrinkle in the large and sprawling quilt of issues about freelance rights is a situation outlined in a posting on the Toronto Freelance Editors and Writers list. Writer Kim Pittaway (former editor of Chatelaine) did an article for More magazine about a program called the Judy Project for CEO-track women at the Rotman School at the University of Toronto. Rotman asked Transcontinental, the publishers of More, if they could reprint the article on their website and were told that there would be no charge and no issue about rights since it was a reprint of a pdf showing the article as published. The Transcon contract does allow for "promotional publication" and the contract clause reads "I recognize that the right of first publication includes the assignment to Transcontinental of the right to use my texts in any promotional or advertising material relating to publications in which my texts might be published." Transcon appears to be taking a very broad definition of what "use in promotional material" constitutes, as this is a 3rd-party website designed to promote the Judy Project, not More Magazine. HEADlines, the Sheridan College's 2008 illustration graduate show -- a showcase for some spectacular student work -- is being held on Thursday April 24 at 7 p.m.to 1 a.m. and 25th 3 pm to 10 pm [CORRECTED TIMES]. It's in the Burroughes building at 639 Queen Street West in Toronto. Sheridan offers the only Bachelor of Applied Arts specializing in illustration in the country. 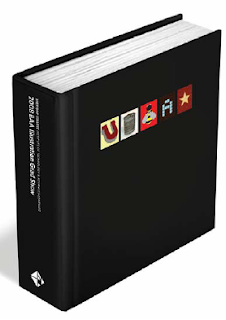 This year, the show annual, has a metal plate embedded in its cover and rearrangeable individual magnets depicting illustrations (rebuses) of letters by the grads. 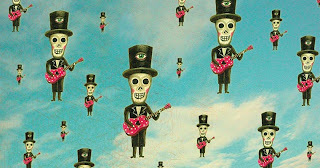 See the review of last year's show. Those who knew and loved Kathy Bergen are mourning her death after an 18-month struggle with cancer. Bergen, who was a skilled production manager for Today's Parent magazine and latterly the Editorial Director of todaysparent.com. She leaves two children, Franny and Tim and Scott, her partner. There will be a memorial service for her on Friday, April 11 at 1 p.m. in the Floral Hall of Edwards Gardens, Toronto Botanical Garden (777 Lawrence Ave East, Toronto). In honour of Kathy, donations can be made to Mt. Sinai's Temmy Latner Centre for Palliative Care (in support of International program activities of the Centre) or Wellspring (81 Wellesley St, E., Toronto). See earlier post about this.